Background Patients with severe asthma are at increased risk of exacerbations and lower respiratory tract infections (LRTI). Severe asthma is heterogeneous, encompassing eosinophilic and non-eosinophilic (mainly neutrophilic) phenotypes. Patients with neutropilic airway diseases may benefit from macrolides. Methods We performed a randomised double-blind placebo-controlled trial in subjects with exacerbation-prone severe asthma. Subjects received low-dose azithromycin (n=55) or placebo (n=54) as add-on treatment to combination therapy of inhaled corticosteroids and long-acting β2 agonists for 6 months. The primary outcome was the rate of severe exacerbations and LRTI requiring treatment with antibiotics during the 26-week treatment phase. Secondary efficacy outcomes included lung function and scores on the Asthma Control Questionnaire (ACQ) and Asthma Quality of Life Questionnaire (AQLQ). Results The rate of primary endpoints (PEPs) during 6 months was not significantly different between the two treatment groups: 0.75 PEPs (95% CI 0.55 to 1.01) per subject in the azithromycin group versus 0.81 PEPs (95% CI 0.61 to 1.09) in the placebo group (p=0.682). In a predefined subgroup analysis according to the inflammatory phenotype, azithromycin was associated with a significantly lower PEP rate than placebo in subjects with non-eosinophilic severe asthma (blood eosinophilia ≤200/µl): 0.44 PEPs (95% CI 0.25 to 0.78) versus 1.03 PEPs (95% CI 0.72 to 1.48) (p=0.013). Azithromycin significantly improved the AQLQ score but there were no significant between-group differences in the ACQ score or lung function. Azithromycin was well tolerated, but was associated with increased oropharyngeal carriage of macrolide-resistant streptococci. Conclusions Azithromycin did not reduce the rate of severe exacerbations and LRTI in patients with severe asthma. However, the significant reduction in the PEP rate in azithromycin-treated patients with non-eosinophilic severe asthma warrants further study. Does maintenance treatment with low-dose azithromycin decrease the rate of exacerbations in adult patients with severe asthma and frequent exacerbations? Azithromycin is a new option for prevention of exacerbations in patients with non-eosinophilic severe asthma. Severe asthma is a heterogeneous disease requiring different add-on treatments according to the underlying asthma phenotype (eosinophilic vs non-eosinophilic (eg, neutrophilic) airway inflammation). We conducted a randomised double-blind placebo-controlled trial to test the hypothesis that long-term add-on treatment with azithromycin decreases the frequency of acute exacerbations and LRTI in patients with exacerbation-prone severe asthma. Since severe asthma is a heterogeneous syndrome, we predefined to analyse the efficacy of azithromycin according to the type of underlying inflammation (non-eosinophilic (mainly neutrophilic) or eosinophilic asthma). Patients were considered eligible if they were 18–75 years of age, had a diagnosis of persistent asthma, a history consistent with Global Initiative for Asthma step 4 or 5 clinical features, received high doses of inhaled corticosteroids (≥1000 µg fluticasone or equivalent) plus inhaled long-acting β2 agonists for at least 6 months prior to screening and had had at least two independent severe asthma exacerbations requiring systemic corticosteroids and/or LRTI requiring antibiotics within the previous 12 months. Subjects were never-smokers or ex-smokers with a smoking history of ≤10 pack-years. Their fractional excretion of exhaled nitric oxide (FeNO) level was below the upper limit of normal. Exclusion criteria are specified in the online supplementary appendix. Patients continued their maintenance treatment with high doses of inhaled corticosteroids and long-acting β2 agonists during the trial. The AZIthromycin in Severe ASThma (AZISAST) study was a randomised double-blind placebo-controlled parallel-group multicentre study (see online supplementary appendix figure S1). The study protocol was approved by the central ethics committee of Ghent University Hospital, and was reviewed by the local ethics committees at each participating site. All patients provided written informed consent. After a 2-week run-in period, patients were randomly assigned in a 1 : 1 ratio to receive add-on treatment with azithromycin or placebo using a central web-based randomisation tool. The hospital pharmacist (Ghent University Hospital) formulated the study drugs: capsules with 250 mg azithromycin (prepared from capsules of Zitromax) or placebo. After randomisation, the patients took one capsule per day for 5 days and then one capsule three times a week. The total treatment period was 26 weeks (until visit 6), with a study drug-free follow-up period of 4 weeks (washout period). Assessments included asthma and medical history, vital signs, physical examination, electrocardiography, imaging, pulmonary function tests, FeNO measurements, blood testing and questionnaires (including the Asthma Control Questionnaire (ACQ) and the Asthma Quality of Life Questionnaire (AQLQ)). A full description of the assessments is given in the online supplementary appendix. Secondary efficacy outcomes included lung function (forced expiratory volume in 1 s (FEV1) pre- and post-bronchodilation), morning and evening peak expiratory flow (PEF), quality of life (AQLQ score) and asthma control (ACQ score). All secondary outcomes were ascertained at visits 2, 3, 4, 5 and 6 (at randomisation and weeks 4, 10, 18 and 26 of the treatment period), except for the questionnaires which were completed by the patient at visits 2, 4 and 6 only. Safety endpoints encompassed adverse events, serious adverse events and adverse events leading to discontinuation. The primary outcome analysis was conducted within the intention-to-treat population. Unpaired and paired t tests were used to assess between- and within-study group differences in symmetrically distributed continuous baseline characteristics and post-treatment outcome measures, respectively. Exact Wilcoxon rank-sum and signed rank tests were used for skewed distributed variables. Proportions were compared between both treatment groups using Fisher exact tests. Mean primary endpoint rates and mean exacerbation rates per treatment group were investigated using Poisson or negative binomial regression as appropriate.18 For the first primary endpoint, log rank tests were performed and Kaplan–Meier curves are shown to present the cumulative survival in the placebo and azithromycin arms. Receiver operating characteristic curve analysis was performed to assess the predictive power of the covariates. Statistical analyses were performed using IBM SPSS statistics V.19 (SPSS Inc, Chicago, Illinois, USA) and R V.2.14.1 (R Foundation for Statistical Computing, Vienna, Austria). 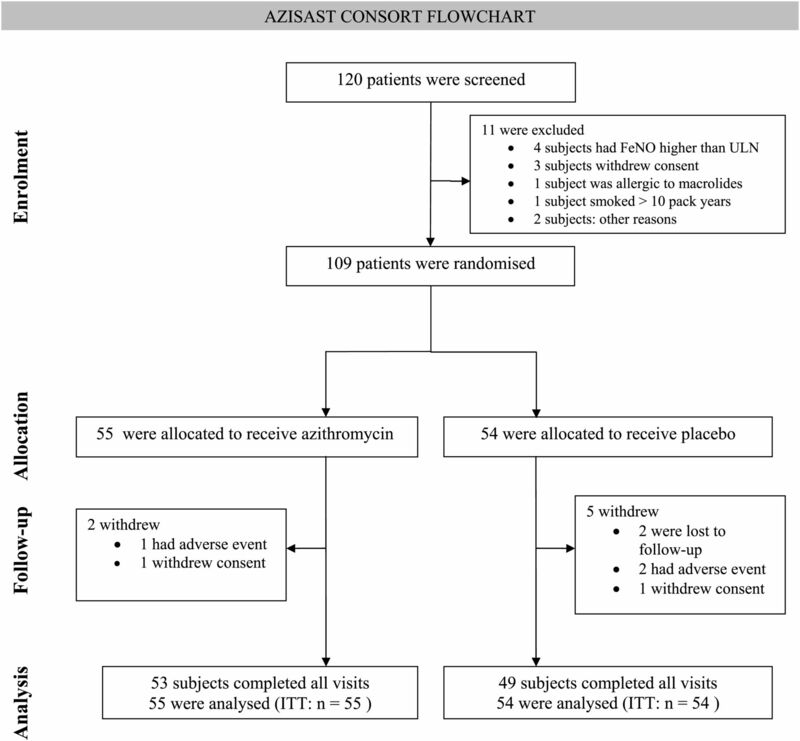 The flowchart of the AZISAST study is shown in figure 1. A total of 109 of the 120 subjects screened were randomised and constituted the intention-to-treat population. Fifty-five subjects were randomly assigned to receive azithromycin and 54 subjects to receive placebo. Overall, 97% of treatment visits were completed. Seven subjects who withdrew (two in the azithromycin group and five in the placebo group) completed a mean of four visits. Subjects in the two treatment arms were well matched with respect to baseline characteristics (table 1). All patients received high-dose combination therapy of inhaled corticosteroids and long-acting β2 agonists for at least 6 months prior to study entry and continued this treatment throughout the entire study. Numbers of patients who were enrolled, assigned to a study group and completed the study. Subjects were recruited by respiratory physicians at the seven participating clinical centres. Patients who completed the 26-week course of the study drug were asked to return 4 weeks later for a washout visit. ULN, upper limit of normal; ITT, intention-to-treat. The median treatment period was 183 days in both the azithromycin group and the placebo group (p=0.269). During this period a total of 39 primary endpoints (mean rate 0.72 per 26 weeks) occurred in the azithromycin group and 43 primary endpoints (mean rate 0.81 per 26 weeks) in the placebo group (p=0.698). In the azithromycin group, 26 (47%) subjects had at least one primary endpoint compared with 26 (48%) in the placebo group (relative risk 0.98, 95% CI 0.68 to 1.43, p=1.000). The cumulative survival times based on the first primary endpoint per patient are shown as Kaplan–Meier survival curves for both treatment arms in figure 2A (p=0.801). The number of primary endpoints per patient is shown in figure 2B (p=0.698). Primary endpoints during the course of the study. (A) Proportion of participants free from primary endpoints for 26 weeks according to study group. The intention-to-treat analyses were based on the participants who were randomly assigned to azithromycin (N=55) or placebo (N=54). A primary endpoint was defined as a severe asthma exacerbation requiring treatment with systemic corticosteroids, emergency room visit or hospitalisation17 and/or an acute lower respiratory tract infection requiring treatment with antibiotics. (B) Distribution of the number of primary endpoints among subjects in each study group during the treatment period of the study. (C) Proportion of subjects with non-eosinophilic severe asthma (defined by a fraction of exhaled nitric oxide lower than the upper limit of normal and a blood eosinophilia ≤200/µl) free from primary endpoints for 26 weeks, according to study group (azithromycin or placebo). In subjects with non-eosinophilic asthma, azithromycin significantly decreased the number of patients with at least one primary endpoint (9 of 27 (33%) azithromycin-treated subjects vs 18 of 29 (62%) placebo-treated subjects; relative risk 0.54, 95% CI 0.29 to 0.98, p=0.037). Thirty severe exacerbations of asthma occurred in the azithromycin group compared with 27 in the placebo group (p=1.000). Twenty patients in the azithromycin group and 29 patients in the placebo group experienced a LRTI requiring antibiotics (p=0.826). There were two hospital admissions for exacerbations of asthma in the azithromycin group and two in the placebo group (p=1.000). The estimated primary endpoint rate based on a Poisson regression model without adjustment was 0.71 (95% CI 0.52 to 0.97) in the azithromycin group and 0.80 (95% CI 0.59 to 1.07) in the placebo group (estimated primary endpoint rate ratio for azithromycin vs placebo 0.89, 95% CI 0.58 to 1.37, p=0.600). After imputation, the estimated adjusted primary endpoint rate during 6 months was 0.75 (95% CI 0.55 to 1.01) in the azithromycin group and 0.81 (95% CI 0.61 to 1.09) in the placebo group (estimated rate ratio 0.92, 95% CI 0.60 to 1.40, p=0.682). A negative binomial regression model did not alter the results.18 When sensitivity analyses restricting the primary endpoint to severe exacerbations of asthma were performed, the estimated severe exacerbation rate based on a Poisson regression model was 0.55 (95% CI 0.38 to 0.78) in the azithromycin group and 0.52 (95% CI 0.36 to 0.75) in the placebo group (estimated primary endpoint rate ratio for azithromycin vs placebo 1.05, 95% CI 0.63 to 1.76, p=0.847). Since severe asthma is biologically heterogeneous, we performed a predefined subgroup analysis comparing the efficacy of azithromycin depending on blood eosinophilia at baseline. In subjects with severe asthma and blood eosinophilia ≤200/µl (non-eosinophilic severe asthma), azithromycin significantly reduced the rate of primary endpoints and of severe exacerbations compared with placebo (figure 2C). The estimated primary endpoint rate for non-eosinophilic severe asthma was 0.44 (95% CI 0.25 to 0.78) in the azithromycin group and 1.03 (95% CI 0.72 to 1.48) in the placebo group (estimated primary endpoint rate ratio for azithromycin vs placebo 0.43, 95% CI 0.22 to 0.84, p=0.013). The estimated severe exacerbation rate for non-eosinophilic severe asthma was 0.26 (95% CI 0.12 to 0.54) in the azithromycin group and 0.62 (95% CI 0.39 to 0.99) in the placebo group (estimated severe exacerbation rate ratio for azithromycin vs placebo 0.42, 95% CI 0.17 to 1.00, p=0.050). In contrast, the primary endpoint rate for eosinophilic severe asthma was 0.96 (95% CI 0.66 to 1.41) in the azithromycin group compared with 0.50 (95% CI 0.28 to 0.88) in the placebo group (estimated rate ratio 1.93, 95% CI 0.98 to 3.81, p=0.058). In patients with eosinophilic severe asthma, the severe exacerbation rate was higher in the azithromycin group than in the placebo group: 0.82 (95% CI 0.55 to 1.24) versus 0.38 (95% CI 0.20 to 0.72) estimated rate ratio 2.19, 95% CI 1.01 to 4.73, p=0.046). In the Poisson regression model there is a significant interaction between the phenotype of severe asthma and treatment arm (p=0.002). At 26 weeks there was a significant improvement in the AQLQ score in the azithromycin group (0.32, 95% CI 0.08 to 0.57, p=0.011) compared with a non-significant trend in the placebo group (0.20, 95% CI −0.01 to 0.41, p=0.057; table 2). There were no significant differences between the groups in the change from baseline in AQLQ score (mean difference 0.12; 95% CI −0.20 to 0.44; p=0.467). At 26 weeks, the mean improvement in the ACQ score was −0.24 (95% CI −0.50 to 0.02, p=0.068) in the azithromycin group compared with −0.12 (95% CI −0.33 to 0.08, p=0.222) in the placebo group (table 2). There were no significant between-group differences in the change from baseline in the ACQ score (mean difference −0.12; 95% CI −0.44 to 0.21; p=0.485). There were no significant between-group differences in the changes in FEV1 (pre- and post-bronchodilator), morning PEF, evening PEF, use of rescue medication and FeNO (table 2). No significant differences were observed in the frequency of adverse events, serious adverse events or adverse events leading to discontinuation of the study drug (see online supplementary table S1). Importantly, no subject in the azithromycin group reported hearing loss. Two clinical centres studied resistance to macrolide antibiotics, obtaining oropharyngeal swabs in 46 participants (23 in each treatment arm) at four visits (see online supplemental figure S1). Eleven subjects (47.8%) in the azithromycin group and nine subjects (39.1%) in the placebo group were colonised with erythromycin-resistant streptococci in the oropharynx at randomisation. At the end of the 26-week treatment period, 87% of the subjects in the azithromycin group and 35% of the subjects in the placebo group were colonised with erythromycin-resistant oropharyngeal streptococci (p<0.001). During the treatment period the proportion of streptococci resistant to erythromycin increased from 17.2% to 73.8% in the azithromycin group and from 7.9% to 17.3% in the placebo group (p<0.001; see online supplemental figure S3). The percentage of macrolide-resistant streptococci numerically decreased from 73.8% to 45.9% in the azithromycin group during the 4-week washout period (p=0.104). In this randomised double-blind placebo-controlled trial in patients with severe asthma, add-on treatment with low-dose azithromycin for 6 months did not decrease the frequency of the primary endpoint (severe exacerbations of asthma and LRTI requiring antibiotics). However, in a predefined subgroup analysis—namely, in subjects with severe non-eosinophilic asthma (as defined by a FeNO lower than the upper limit of normal and a blood eosinophilia ≤200/µl (the median value of blood eosinophilia in our ITT population))—add-on treatment with azithromycin was associated with a significant reduction in primary endpoints and in the rate of severe exacerbations. Azithromycin improved quality of life and was well tolerated. The beneficial effects of azithromycin in non-eosinophilic severe asthma might be due to antibiotic properties or anti-inflammatory and immunomodulatory effects. Chronic respiratory infection with atypical bacteria such as Mycoplasma pneumoniae or Chlamydophila pneumoniae might play a role in the pathogenesis of severe asthma.28 However, a trial of roxithromycin in subjects with asthma and serological evidence of infection with C pneumoniae did not improve asthma control,20 which is in line with our observations that positive IgG antibodies to C pneumoniae did not predict therapeutic efficacy of azithromycin in severe asthma. Long-term treatment with azithromycin in our study appeared to be safe, since the frequency and severity of adverse events was not different from placebo. In particular, no subjects in the azithromycin-treated group mentioned hearing loss, which contrasts with the hearing decrements reported by Albert et al in patients with chronic obstructive pulmonary disease (COPD).15 The older age of the subjects with COPD, more frequent comorbidities, the higher dose of azithromycin used and the intensive monitoring by means of audiometry in the COPD study might explain this difference. Recently, a retrospective observational database study has suggested a small increased risk of cardiovascular death among patients with a high baseline risk of cardiovascular disease taking azithromycin during 5 days for acute infections.29 Since we excluded patients with significant cardiovascular disease, a prolonged corrected QT interval or use of drugs known to cause QT prolongation, there were no serious cardiac adverse drug reactions in our study. A concern of chronic treatment with azithromycin is the induction of resistance to macrolides. 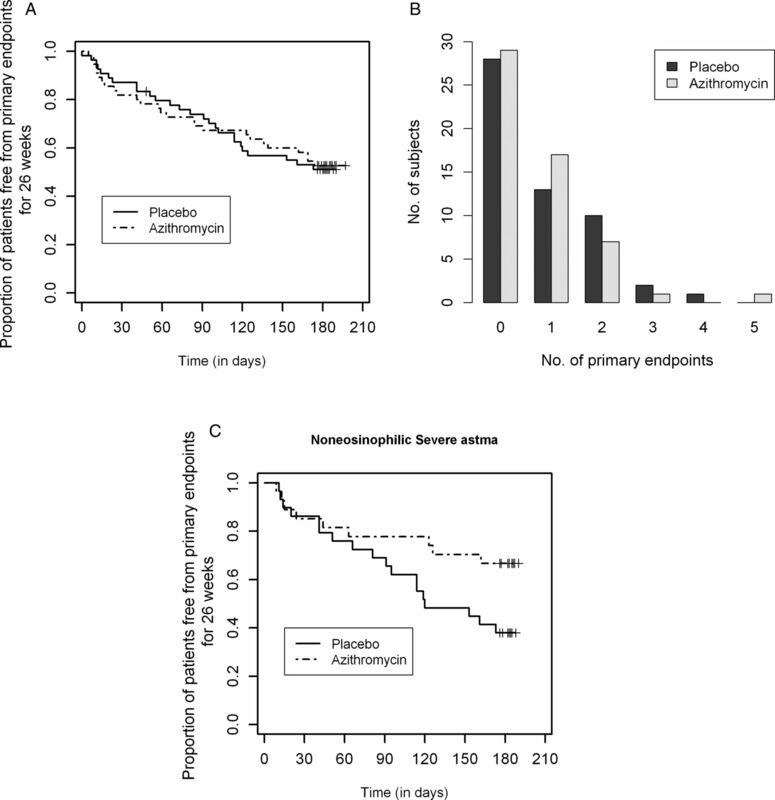 Short-term treatment with macrolides induced a significant increase in macrolide-resistant pharyngeal streptococci in healthy volunteers.30 In our study, long-term treatment with azithromycin was associated with an increased proportion of macrolide-resistant oropharyngeal streptococci, confirming the increased incidence of macrolide resistance in the nasopharyngeal flora in the COPD Clinical Research Network study.15 However, in both studies, there is no evidence suggesting that colonisation with macrolide-resistant organisms increased the risk of LRTI or pneumonia. In summary, this is the first randomised controlled trial examining the efficacy and safety of add-on treatment with low-dose azithromycin in adults with exacerbation-prone severe asthma. Although azithromycin was not superior to placebo in the total population, we demonstrated a significant reduction in primary endpoints in non-eosinophilic severe asthma. This observation is biologically plausible, since macrolides have been shown to be effective in neutrophilic chronic airway diseases such as cystic fibrosis (CF), non-CF bronchiectasis, diffuse panbronchiolitis and COPD. The induction of macrolide resistance in the nasopharyngeal and oropharyngeal flora in azithromycin-treated subjects is of concern. In addition, the long-term effects of macrolide treatment on microbial resistance in the community are not known. We acknowledge all patients, physicians, clinical trial nurses, data managers and other collaborators who contributed to the AZISAST study.
. Asthma: defining of the persistent adult phenotypes. Lancet 2006;368:804–13. The ENFUMOSA cross-sectional European multicentre study of the clinical phenotype of chronic severe asthma. European Network for Understanding Mechanisms of Severe Asthma. Eur Respir J 2003;22:470–7.
. Consistently very poorly controlled asthma, as defined by the impairment domain of the Expert Panel Report 3 guidelines, increases risk for future severe asthma exacerbations in The Epidemiology and Natural History of Asthma: Outcomes and Treatment Regimens (TENOR) study. J Allergy Clin Immunol 2009;124:895–902 e1–4.
. Identification of asthma phenotypes using cluster analysis in the Severe Asthma Research Program. Am J Respir Crit Care Med 2010;181:315–23.
. A large subgroup of mild-to-moderate asthma is persistently noneosinophilic. Am J Respir Crit Care Med 2012;185:612–19.
. Analysis of induced sputum in adults with asthma: identification of subgroup with isolated sputum neutrophilia and poor response to inhaled corticosteroids. Thorax 2002;57:875–9.
. Asthma and cigarette smoking. Eur Respir J 2004;24:822–33.
. Long-term macrolide therapy in chronic inflammatory airway diseases. Eur Respir J 2009;33:171–81.
. Long term azithromycin in children with cystic fibrosis: a randomised, placebo-controlled crossover trial. Lancet 2002;360:978–84.
. Prophylactic antibiotic treatment of bronchiectasis with azithromycin. Thorax 2004;59:540–1.
. Erythromycin and diffuse panbronchiolitis. Thorax 1997;52:915–18.
. Neomacrolides in the treatment of patients with severe asthma and/or bronchiectasis: a retrospective observational study. Ther Adv Respir Dis 2011;5:377–86.
. Long-term erythromycin therapy is associated with decreased chronic obstructive pulmonary disease exacerbations. Am J Respir Crit Care Med 2008;178:1139–47.
. Azithromycin for prevention of exacerbations of COPD. N Engl J Med 2011;365:689–98.
. Statistical analysis of COPD exacerbations. Eur Respir J 2008;32:1421–2.
. Mycoplasma pneumoniae and Chlamydia pneumoniae in asthma: effect of clarithromycin. Chest 2002;121:1782–8.
. Trial of roxithromycin in subjects with asthma and serological evidence of infection with Chlamydia pneumoniae. Am J Respir Crit Care Med 2001;164:536–41.
. Anti-inflammatory effect of roxithromycin in patients with aspirin-intolerant asthma. Clin Exp Allergy 1999;29:950–6.
. Clarithromycin targets neutrophilic airway inflammation in refractory asthma. Am J Respir Crit Care Med 2008;177:148–55.
. A trial of clarithromycin for the treatment of suboptimally controlled asthma. J Allergy Clin Immunol 2010;126:747–53.
. Macrolides for chronic asthma. Cochrane Database Syst Rev 2005;(4):CD002997.
. Clarithromycin suppresses bronchial hyperresponsiveness associated with eosinophilic inflammation in patients with asthma. Ann Allergy Asthma Immunol 2000;84:594–8.
. Macrolide-induced Churg-Strauss syndrome in a patient with atopy. Lancet 1997;350:563.
. A link between chronic asthma and chronic infection. J Allergy Clin Immunol 2001;107:595–601.
. Azithromycin and the risk of cardiovascular death. N Engl J Med 2012;366:1881–90.
. Effect of azithromycin and clarithromycin therapy on pharyngeal carriage of macrolide-resistant streptococci in healthy volunteers: a randomised, double-blind, placebo-controlled study. Lancet 2007;369:482–90.
. Mepolizumab for severe eosinophilic asthma (DREAM): a multicentre, double-blind, placebo-controlled trial. Lancet 2012;380:651–9.
. An official ATS clinical practice guideline: interpretation of exhaled nitric oxide levels (FENO) for clinical applications. Am J Respir Crit Care Med 2011;184:602–15. Contributors GGB: study design. GGB, CVS, PJ, RD, HS, VR, GVM, IKD, GFPJ: patient recruitment, enrolment, randomisation and follow-up. AD, BD, JV: collection of the data. GC, JB and EP: bacteriological and serological analyses. GGB, CVS, KV, GVM, ED, GFPJ: analysis and interpretation of the data. GGB, GVM, KV, JB, EP, ED, GFPJ: writing of the report. Patient consent All patients provided written informed consent, as required by Belgian Law and the Ethical Committees involved. Ethics approval The study protocol was approved by the central ethics committee of Ghent University Hospital, and was reviewed by the local ethics committees at each participating site. Funding The AZIthromycin in Severe ASThma (AZISAST) study was an academic clinical trial, without sponsorship from the pharmaceutical industry. The study was funded by the Agency for Innovation by Science and Technology (IWT 70709), Flanders, Belgium. The study sponsor (IWT) had no role in the study design; in the collection, analysis, and interpretation of data; in the writing of the report; and in the decision to submit the paper for publication. Macrolides for yet another chronic airway disease: severe asthma?